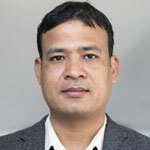 Bijay Kumar Shresta, Senior Programme Finance Officer/Unit Head, has more than 17 years of experience in financial management, partner capacity and risk assessment, financial monitoring, capacity building, and NGO governance in development sectors. He holds a double master’s degree in management and in rural development with specialisation in gender and cooperative. Mr Shresta has experience in financial management including: multi-country, multi-donor, multi-currency fund management, strategic support and succession planning, budgeting and forecasting, financial analysis tool development, and financial performance reporting. He also has training in strategic financial management, fraud management, development approaches and has international financial monitoring experience. Before joining ICIMOD, Mr Shresta worked with Oxfam Nepal, ActionAid Nepal and SCDF.